Created in 1956, the current formula of Christian Dior Diorissimo is still simple and luminous. It's all about lily-of-the-valley, a scent that has significant memories for me. As a kid, my first "grown up" bubble bath was lily-of-the-valley and boy did I love that stuff! 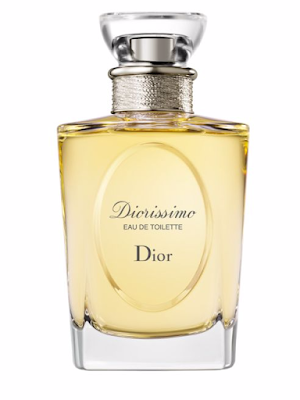 In Diorissimo I can also sniff out lilac and jasmine and underneath the animalic note civet. This all makes it a rather old-fashioned floral that somehow reminds me of ballerinas. The 5 ml sample I got is the perfect size for me because, lovely as it is, I don't think I'll be in the mood for it all that often. I first discovered Clinique Beyond Rose at Harrod's in London where it was exclusive to the store at the time. Now you can buy it over here, not in shops but on select perfume websites. It is an almost aggressive amber rose, not fru-fru in any way. In fact I would say it is the sexiest rose perfume I own. Underneath its bad girl rose exterior lies the gourmand note of balsamic pepper. I imagine it to be pink peppercorns, not the plain old black ground stuff you get at Safeway. Beyond Rose doesn't last on me all that long but it is the type that wants to be sprayed lavishly so that makes up for it. 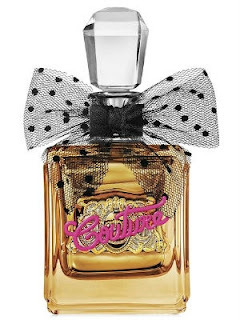 I was just going to get a roller ball of Juicy Couture Viva La Juicy Gold Couture but then strongly felt I needed a full bottle because the packaging was so fun. This is a sensual caramel with big notes of sandalwood that hint of the Middle East. Yes, it is very much a commercial perfume, but I had to have it because it is deeply comforting to me. The PR for Gold Couture says it is glamorous and decadent but I also find it warm and delicious. 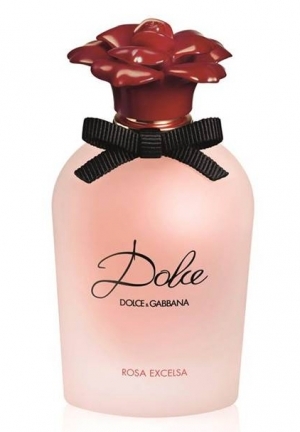 Dolce&Gabana Dolce Rosa Excelsa was another one I was going to just get a rollerball of but caved in and bought a full size because I adored the bottle. 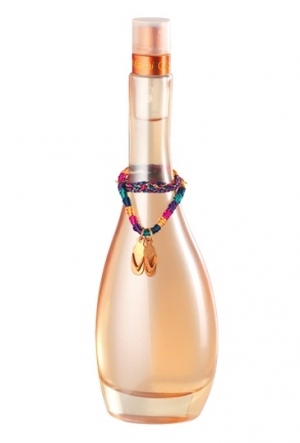 There is something to be said for the romance of a lovely bottle sitting on your dresser. Rosa Excelsa is as much about other florals as it is about rose. Here the rose is tucked away in a watery bouquet of amaryllis, water lily and white daffodil. In the Middle East rose is a perfume note preferred by men and I can almost imagine this particular perfume, with its additional notes of neroli leaves and musk, to be worn by a man (I don't think they'd go for the packaging though lol). 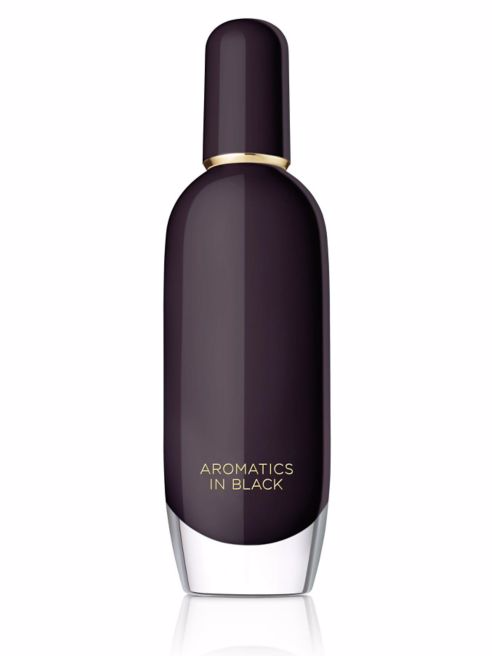 I like to describe Clinique Aromatics in Black as "nostalgic". But that may not help you because nostalgic is such a subjective word. What may trigger memories for me may not trigger memories for you. I could also describe it as "old lady", meant in the best possible way. A kinder way to put it would be "powdery-fruity". 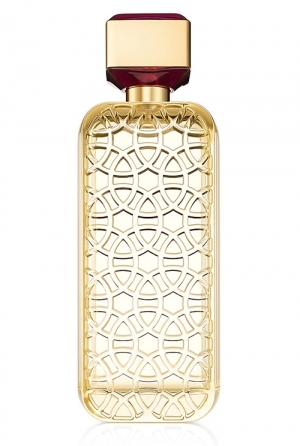 Some of the notes include plum leaf accord, pink grapefruit, jasmine, myrrh, vetiver, and tonka bean. It's actually a fantastic blend. But bottom line it reminds me of a magical time of my life when I was surrounded by older, wiser, nurturing women who were quite majestic in their own right. With this scent I can hope to be like them. 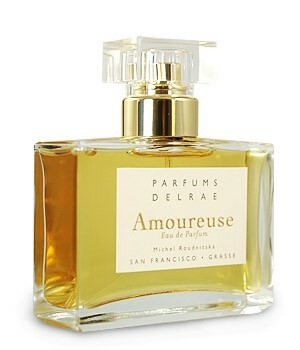 Parfums DelRae Amoureuse is all out vintage-style glamour. Despite the very present notes of cardamom and honey it is the dirty anamalic jasmine that is dominant. Throw in some other white florals and moss and sandalwood, and now you have a scent of irresistible allure. It's bosomy, and some might say a bit over-the-top, but that is exactly why I am in love with it. It makes me feel like a 1950s starlet a la Jayne Mansfield. I only got a 1 oz sample but you can bet I will be saving up for a 50ml. I got a free Jennifer Lopez Miami Glow from Amazon because they gave me store credit for some reason. And I'm very glad it was free. I chose it because I have the original JLo Glow which I like, and one of my best beauty YouTubers said that the Miami Glow was a favorite of her perfumes. I enjoy some of her other faves, and she described this one as tropical/perfect for summer fun. Well. It turns out I don't find Miami Glow tropical or fun. It smells like bathroom cleanser. Maybe how a bathroom at a nice restaurant might smell, but still a bathroom. And it's not awful because it's a cheapie celebrity scent. Many perfumistas really like JLo Glow and JLo Still, so I don't think I was out of line to order this without smelling it first. I guess some you win, some you LOSE. Did you buy any pretty perfumes this summer? Or what do you collect?